Under Bezbatchenko, Toronto FC made several high-profile moves during the 2013–14 off season. 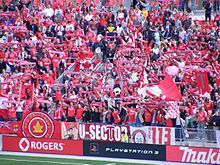 Among the transfers were MLS veterans Justin Morrow and Jackson; Brasileiro star Gilberto, United States international Michael Bradley of A.S. Roma, and the return of Toronto FC leading goal scorer De Rosario. On January 10, 2014, Tottenham Hotspur announced they had agreed a deal with the team over the transfer of England international Jermain Defoe for a reported fee of £6 million, and an Advertising Rights Agreement with Maple Leaf Sports & Entertainment Ltd. Defoe would earn a reported £90,000 a week, making him the highest earner in MLS. These moves required the trade of Matias Laba to Vancouver to comply with MLS's maximum of three designated players per team. On February 7, 2014, Brazil national team keeper Júlio César joined on loan from Queens Park Rangers. The team started the year with promise, but much like 2010, they floundered after the World Cup break. On August 31, Nelsen was fired by Bezbatchenko a day after a 0���3 defeat to the New England Revolution at BMO field, where Nelsen criticized Bezbatchenko in his post-match press conference for putting the players under needless pressure in the media. The head coaching position was filled by former American international and Chivas USA assistant, Greg Vanney. Although the team won the most games in its history, it failed to reach the playoffs for the eighth consecutive year. After completing only 11 months of his four-year contract with TFC, Defoe joined Premier League club Sunderland on January 16, 2015. On the same day, Toronto received Jozy Altidore from Sunderland to complete the other half of the player swap. Three days later, the team signed Italian international Sebastian Giovinco from Juventus on an annual salary of $7 million.